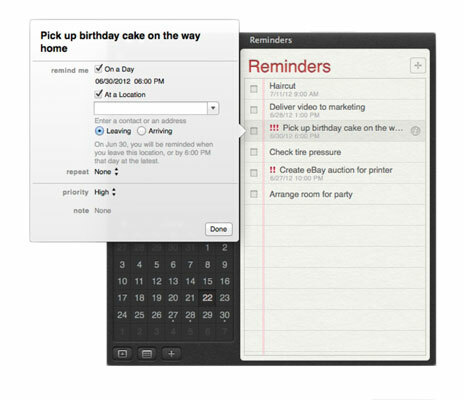 Your MacBook gives you a few options for using Reminders. Most people in today’s fast-paced world juggle several appointments, errands, meetings and other scheduling responsibilities. Who couldn’t use a little help keeping things straight? Search box: Click here and type a phrase or name to search for it among your reminders. Hide/Show Reminders Sidebar: Click this button to hide or show the Reminders sidebar. You save a significant amount of screen real estate when the sidebar is hidden. Calendar: This handy calendar indicates which days of the current month already have pending reminders, which are displayed with a dot under the date. You can jump to any date by clicking it. To move forward and backward through the months, click the Previous and Next buttons next to the month name. New List button: Click this button to add a new reminder list to the sidebar; from the keyboard, press cmd+L. The list name is highlighted in a text box, so you can simply type the new name and then press Return. Reminders: These entries are the actual reminders themselves. Each is prefaced by a check box so you can select the check box when the reminder is complete, thereby moving that reminder automatically to the Completed list. And yes, if you select the Completed list in the sidebar and deselect the check box for a reminder, it returns (like a bad penny) to the original list. Add Reminder button: Click this button to add a new reminder to the currently selected list; from the keyboard, press cmd+N. In its simplest form, a reminder is just a short phrase or sentence. Press Return afterward to save the reminder to your list. Adding a reminder is pretty straightforward. First, click a date in the calendar display to jump to that date, and then click the Add Reminder button. Type a few words and press Return to create a basic reminder. 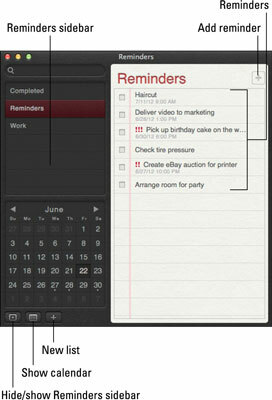 However, if you hover the cursor over the reminder you just created, an Info button appears next to the text. The game is afoot! Click the Info button to display the settings. Reminder text: Click this text to edit the reminder text itself. On a Day: Select this check box if the reminder should appear in the Notification Center on a particular day. By default, the date is the one selected when you created the reminder. You can click the Date and Time fields to change them. At a Location: Select this check box, and you can choose a card from your Contacts application that includes an address. Now reminders will monitor your current location on your 3G/4G iOS device, and notify you when you’re leaving or arriving at the location. You could create a reminder that notifies you on your iPhone when you’re arriving at the mall on September 15 to pick up a watch. Repeat: Set this reminder to automatically repeat every day, week, two weeks, month, or year at the same time. Priority: You can assign one of four priorities to the reminder: Low, Medium, High, or None. Assigning a priority prefaces the reminder text with one (Low), two (Medium), or three (High) red exclamation points so that the reminder stands out from the crowd. Note: Click next to the Note field to enter a free-form text note along with the reminder. Click Done on the Edit sheet when you’ve finished making changes. You can edit a reminder as often as you like. To delete a reminder from a list, right-click it and choose Delete from the menu that appears.